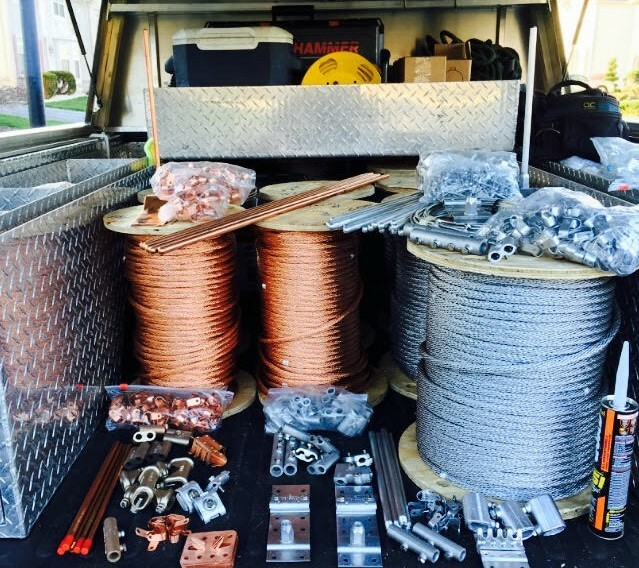 Copper conductors: 1/2″ diameter braided cable consisting of 32 strands of 17 gauge copper wire. Aluminum conductors: 5/8″ diameter braided cable consisting of 26 strands of 14 gauge aluminum wire. Rods over 24″ are available to order with a required brace. These devices are installed on electric service panels to prevent dangerous high voltage from entering a structure through the incoming wires. The arrestor works as a filter to defray incoming voltage, thus preventing a lightning-induced electrical fire or explosion. These are installed between the appliance, electronic equipment or computer and the electrical outlet to provide point-of-entry surge suppression from lightning induced power surges. Structures which contain sensitive electronic equipment may require a series of individual surge suppressors. Surge suppressors are not a required component of UL approved lightning protection system and can be implemented with the lightning protection system at the owner’s discretion or per installer’s recommendations. Ornate points are available in a variety of selections to enhance the appearance of traditional lightning rods of a structure.